Just Love Me - JaiBaba.com! Your Avatar Meher Baba Oasis on the net! 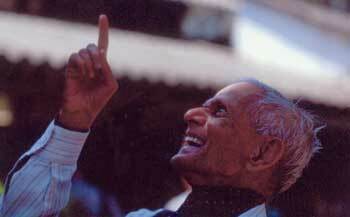 Those times I spent with Beloved Baba in Guru Prasad offered me a delightful kaleidoscope of heart-touching moments. Some brought a smile to my lips, others a tear to my eye, but all contributed to bringing me ever closer to abandoning my mental prejudices, and to understanding that the only thing that matters is whole-hearted love for Baba, the Awakener of Hearts. One weekend there was a fairly large group of lovers who were happily taking advantage of the opportunity Baba was giving to have His darshan. As usual the mood was quite light-hearted and informal. Several bhajan singers were pouring their hearts out to their Beloved in song. Baba was enjoying the music and the atmosphere that developed was especially intimate. In between songs, Baba emphasized that the only thing that mattered was love. Baba's love for us, in that room, was not an abstract philosophical proposition, but was palpably real and something we all, to varying degrees, experienced. I remember once there happened to be a group from Navsari, and one young man, who was relatively new to Baba, felt so inspired that he spoke up and said, "Baba, when I go home, would it be all right if I keep silence for one day a week." Baba gestured, "Very good," and there may even have followed some discussion as to what day of the week would be best. Then the general darshan program continued as before. After some time, this young man spoke up again. "Baba, would it be all right, when I go home, if I keep fast one day a week?" Again Baba seemed pleased and gestured that this was a good idea. Baba patted his stomach and indicated that keeping fast could be very helpful for one's health and that one's digestion could benefit from this discipline. After a few more minutes, the group's time to be with Baba was over, so paying their loving respects, they left the hall. Once they had gone, Baba turned to us and gestured, "Here I've been telling them to just love me, and that man, on his own, has added two more bindings. Now he is bound to do that,” and Baba brought His wrists together as if they were being shackled. Then Baba smiled a rueful smile and added, "It's good that they didn't stay longer or that man would have bound himself even further."